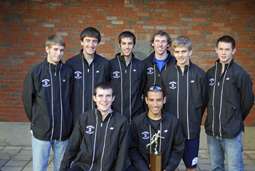 The men's cross-country team: Back row, from left: Marc Boutin '12, Dan Anastos '11, Devon Holgate '11, Chris Brown '12, Ed Colvin '14, Taylor Dundas '14. Front row, from left: Paul Norton '11, Kerwin Vega. With a third-place finish at the 2010 New England Regionals, the Brandeis men's cross-country team has qualified for the National Collegiate Athletic Association Division III Championships, which will be held Nov. 20 at Wartburg College in Waverly, Iowa. The Judges will be making their 24th appearance at the NCAA championships, the most among New England schools and tied for fifth-most among all Division III schools with St. John's (Minn.) and St. Thomas (Minn.). The Judges finished 20th nationally in 2008 and 24th in 2009, but also own 12 top-10 finishes, including a national championship in 1983. Brandeis and Williams College are the only two men's cross-country programs from New England to have qualified for each of the past three national championships. Brandeis finished in third place at this year's New England Regional, held at Williams College on Nov. 13, thanks to three All-New England performances. Senior Paul Norton of Amherst, Mass., ran his eight-kilometer race in 26:00, just under three seconds out of the top five. Norton has now finished in the top 10 in the last three NCAA regionals, and will try for his second career All-America honor. He finished seventh at nationals in 2009. Also placing in the top 25, were junior Marc Boutin of Westford, Mass., with a time of 26:16.3 and senior Chris Brown of North Chelmsford, Mass., with a time of 26:21.9. Boutin and Brown were 16th and 24th, respectively. For Boutin, in his first race of the 2010 season, it marked his best finish at New Englands, up two spots from 2009. Brown was two spots shy of a career best, having finished in 22nd as a rookie. Also running well were rookie Ed Colvin of Roslindale, Mass., who finished in 38th place, just over two seconds shy of a third All-Region performance. Colvin was third among first-year runners with a time of 26:44.0. Senior Dan Anastos of Peabody, Mass., finished 54th with a time of 27:02.0 to round out the scorers, while classmate Kerwin Vega of Waltham, Mass., finished just behind him in 55th, with a time of 27:02.9. Senior Devon Holgate of Cumberland, R.I., was the team's final finisher, coming in 72nd with a time of 27:20.1. Norton is a 2007 graduate of Amherst Regional High School. Boutin is a 2008 graduate of Westford Academy. Brown is a 2008 graduate of Chelmsford High School. Colvin is a 2010 graduate of Catholic Memorial High School. Anastos is a 2007 graduate of Peabody Veterans Memorial High School. Vega is a 2007 graduate of Waltham High School. Holgate is a 2008 graduate of Cumberland (R.I.) High School.